Participating in a an indoor cycling class can burn between 300 and 600 calories per session, notes the American Council on Exercise. In these classes, imagery and the group’s energy add interest to the monotonous exercise of riding a stationary bike. Instructors cue students to alter the pedaling resistance to simulate different terrains. Coming up with fresh workouts that satisfy members’ desire for intensity and fun is a challenge for any instructor. 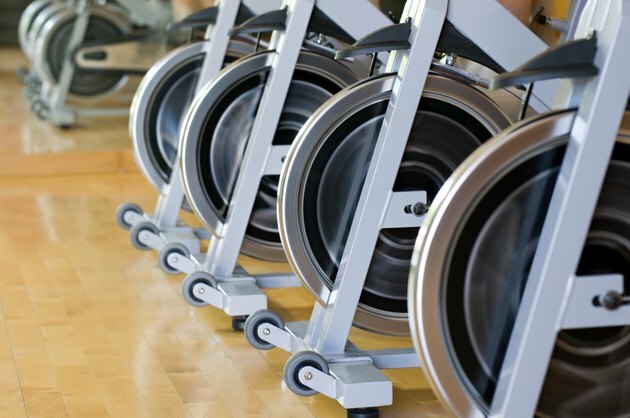 Simulating hills is one way to create a strong, challenging indoor cycling class. A class devoted to hills improves leg strength by forcing members to use significant resistance. A hill class might include a series of inclines that gradually increase in length. Warm up for five to seven minutes on a flat road. Take the riders up a steep hill for one minute, and let them ride a flat for 30 seconds. The next hill lasts two minutes, with a one minute flat. Continue to increase the length of time spent on the hill by one minute and the length of time on the flat by 30 seconds until you reach five minutes on the hill and two and a half minutes on the flat. Descend the pyramid, starting with a four minute hill and two-minute flat until you finish with the one minute hill. Cool down for about five minutes. Try to keep rpm between 60 and 80 when climbing hills. A class based on speed drills will also challenge students and build endurance. After a warm-up, ask riders to pedal on a flat road to perform four consecutive speed drills of one minute each, with a minute of modest speed between. For the next series of four, one-minute drills instruct riders to find a steep hill. Perform a third set of speed drills from a standing position on an even steeper hill. For the final set of four, one-minute drills, have students to ride a “windy” flat from a standing position. Remind students that safety and power are maximized when speeds are kept between 80 and 110 rpms. Take advantage of the motivation of group exercise and divide the class up into teams. You can simply split the room down the middle, or split the class up by gender, birthday or clothing color. Let the group ride together up a few hills, and then ask one group to “breakaway”--speeding up a hill. Both teams can then ride along a straight-away for a few minutes and then one team may perform a speed drill while the other cheers for them. Bring the group back together for another long hill and ask the other team to “breakaway.” Continue the series for the entire 40-minute ride.